All the latest news from WEBBA will be posted here for you to see. Fran Calver from St Breward in Cornwall has recently stepped down from West of England Brass Band Association (WEBBA) after 23 years dedicated service. Fran was recently presented with an engraved posy bowl by WEBBA Chairman John Woods. 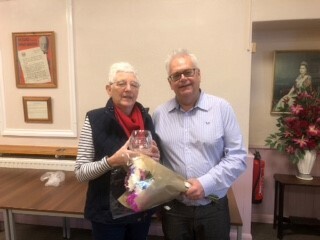 At the recent Regional Championships in Torquay John paid tribute to Fran who has been an important member of the WEBBA team since 1996, and was Chair from 2002 to 2013 when she adopted Registrar duties. The 2020 West of England Regional Championships will take place on Saturday 14th & Sunday 15th March at the Riviera International Conference Centre, Torquay. The Fourth, Second and First Sections will be held on the Saturday and the Third and Championship Sections on the Sunday. If you require any further information please contact our secretary Sue Oldfield via email at . The WEBBA team look forward to seeing you at the West of England Regional Championships at the Riviera International Conference Centre, Torquay on 9th & 10th March. No advance ticket sales - all tickets available to purchase at the door on the day (card payments accepted). If you require any further information please contact the secretary Sue Oldfield on 01392 660904 or 07768 973095 or email . The following PROVISIONAL dates have been set for future West of England Regional Finals. Until finalised by the Council, these are subject to change. WEBBA are pleased to announce the panel of adjudicators for the 2019 West of England Regional Championships are Major David Barringer MBE, Alan Bourne, Dr Nick Grace OBE, Ludovic Neurohr & Brian Rostron. A reminder that the closing date for receipt of entries is Saturday 12th January 2019. Many congratulations to all of the Musical Directors and players who represented the West of England at the National Championships at London or Cheltenham recently. Well done to you all! Special congratulations to Gosport Solent Brass who were awarded fourth place in the 4th section. Preparations for our 2019 Regional Championships are already well underway and entry forms will be available in just a few weeks' time. If your band has appointed a new contest secretary in recent months, please make sure you have notified our secretary accordingly. WEBBA's new Privacy Statement has now been published on our website and will remain accessible from the bottom of each page. The 2019 West of England Regional Championships will take place on Saturday 9th & Sunday 10th March at the Riviera International Conference Centre, Torquay. The Fourth, Third and First Sections will be held on the Saturday and the Second and Championship Sections on the Sunday. 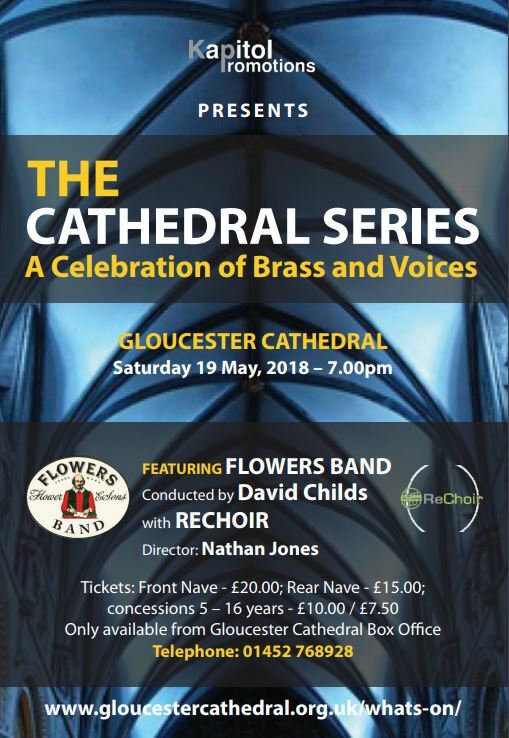 CATHEDRAL SERIES: SPRING CONCERT - "A CELEBRATION OF BRASS & VOICES"
Kapitol Promotions Ltd, the organisers of the National Brass Band Championships of Great Britain, are delighted to announce a fabulous musical concert that will be taking place on Saturday 19th May 2018 in Gloucester. As the first of their new "Cathedral Series" of concerts, and surrounded by the wonderful architecture of Gloucester Cathedral, two ensembles will perform in a Spring Concert featuring a diverse range of music to suit all tastes. Flowers Brass Band, who were recently crowned "West of England" Regional Champions - for the 7th time in the last 9 years - and who will be representing the "West of England" at the National Finals in October, will be showcasing their dazzling talents at this concert as they perform a wide range of entertaining pieces throughout the evening. Flowers Band are one of the highest ranked brass bands in the world, so under the direction of Musical Director, David Childs (who is regarded as the finest euphonium player of his generation), their appearance at this concert is not to be missed! Also performing during this terrific evening of music-making will be ReChoir, a contemporary chamber group based in South Wales. They describe themselves as a "function choir with a unique take on modern choral music", and have performed extensively all over the country including on the 2013 UK tour of Godspell and bizarrely for Domino's Pizza's 20 year celebrations! The concert will be expertly compered by the engaging David Hayward, and tickets are available right now. Tickets are priced at £20.00 (Front Nave) and £15.00 (Rear Nave) for adults, and £10.00 (Front Nave) and £7.50 (Rear Nave) for children ages 5-16, so please contact the Gloucester Cathedral Box Office on 01452 768928 for more information and to book your tickets. The WEBBA team look forward to seeing you at the West of England Regional Championships at the Riviera International Conference Centre, Torquay on 10th & 11th March. No advance ticket sales - all tickets available to purchase at the door on the day. Happy New Year from all at WEBBA! A reminder that the closing date for receipt of entries to the 2018 West of England Regional Championships is Saturday 13th January. Please review our 2018 website page for further guidance regarding the new electronic entry process. If you require any additional information please contact Sue Oldfield at . WEBBA are pleased to announce the panel of adjudicators for the 2018 West of England Regional Championships are Brett Baker, Stan Lippeatt, Alan Morrison, David Roberts, Duncan Stubbs OBE and John Winterflood. The Championships will take place on Saturday 10th & Sunday 11th March 2018 at the Riviera International Conference Centre, Torquay. Additionally, guidance for the grading of new bands has been provided and can be found on the 2018 page. All further details will be confirmed after the WEBBA meeting in January 2018. Any future updates will be added to our website. Many congratulations to the musical directors and players of all the bands who represented WEBBA at the National Finals at Cheltenham last weekend. Very well done to you all! Two local contests are taking place over the next few months. 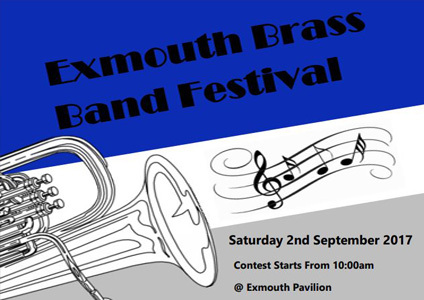 On 2nd September the SWBBA's Exmouth Brass Band Festival is being held at the Exmouth Pavilion. 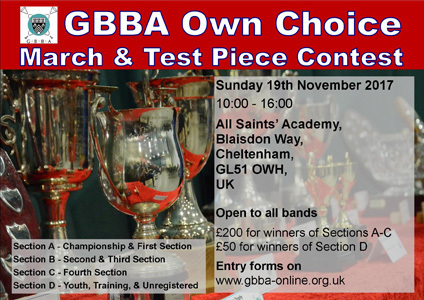 Cheltenham will play host to the GBBA's Own Choice Contest, taking place on 19th November. Many congratulations to all of the Musical Directors and players who took part in the National Championships at London or Cheltenham recently. Our representatives in the finals clearly demonstrated that Brass Banding continues to thrive in the West of England with all of our bands competing in the Championship, First and Second sections finishing in the top ten! Very well done to you all from WEBBA.